It’s official! I have the means to write a novel. On my phone! It’s called “predictive text”. “Once upon a time when you have any problems with your friends and colleagues, you can get a free Gmail address so you don’t have to be a little bit more than a few days ago. I have a great way to get your hands on the Internet and the best way for you to be in touch with the latest version of the best of luck. 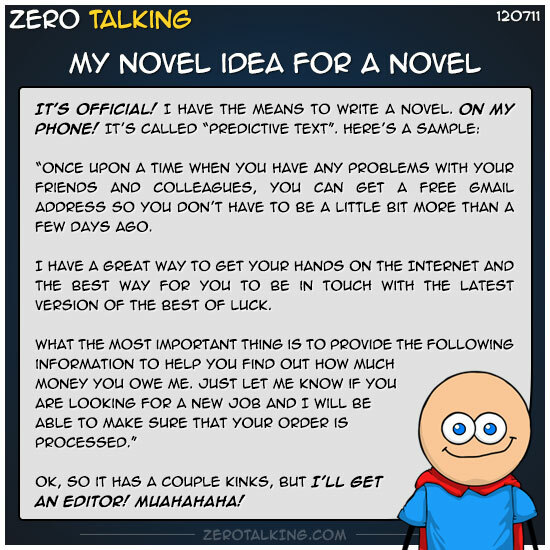 Ok, so it has a couple kinks, but I’ll get an editor! Muahahaha! *This was actual unaltered predictive text.